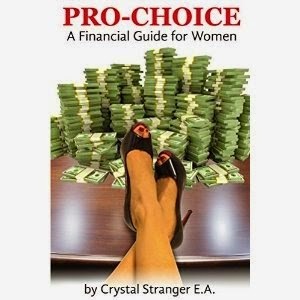 Today we are interviewing Crystal Stranger, author of the personal finance book Pro Choice- A Financial Guide for Women. I’m an Enrolled Agent (EA) professionally, owner of the online tax firm 1st Tax and I also do financial consulting. I live in Honolulu, Hawaii with my boyfriend and 18 month old daughter. I want to set an example for my daughter and create a guide that will help women everywhere be more financially together. Also, finance is such a complex subject and it seems like many advisors take advantage of this and brainwash people into feeling like they are dumb about money. It’s really not that difficult to learn, and no broker is ever going to care as much about your finances as you do. Millenials have been deemed 'savers' by the financial community. While there are useful tidbits in the book for people of all ages and income brackets, I think young women who are saving and just starting their investing timeline can especially benefit from this. What inspired you to write a financial guide for women? What do you think is the most important think for women who are interested gaining more control of their financial situation? I think for many women the most important thing is viewing finances objectively, stepping back and looking at the big picture. There is always money for saving and investing somewhere, or options to make more money, but sometimes it takes a new way of looking at the situation to find where that may be. In your book, you write about how you believe women have an advantage in investing and business. Can you elaborate on this? This isn’t just my belief, statistics have shown this to be true time and again. I think there are a number of reasons this proves true, but a large factor is the same thing that my helicopter instructor always told me was why he thought women make better pilots. He called most of the men who would come and take lessons flying 'cowboys' and said they always thought they knew more about flying than they really did. Whereas women are less ego attached and more likely to research an answer or ask for help when needed. How do you think reading your book will impact women? My hope is that it will help many women make better financial choices in their lives so they can be of greater benefit to their families and communities. I have a couple more projects in the works, a tax guide for expats and a book about ethical investing I started years ago but haven’t had time to finish. I was really surprised when researching this book how few good examples of self-made female investors I could find. It was really hard to find enough to start each chapter with a story, and I hadn’t anticipated that. If you google ‘investor’ all the pictures that show up are men, even though Geraldine Weiss had one of the greatest annualized returns in history, second only to Warren Buffett. I feel really inspired by these women and hope that the readers of my book will feel inspired by their stories as well and take it the step beyond and take their lives to the level where they will be the success stories others look up to in the future.